These colours were trooped for the last time at Woking football ground on July 12th 1963. 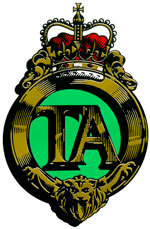 The Colours of the 4th Battalion The Queen's Royal Regiment (TA) were presented by Her Majesty Queen Mary at Croydon on 7th May, 1938. Her Majesty Queen Mary also presented the Colours of the 5th Battalion The Queen's Royal Regiment (TA) at Guildford on 28th April, 1936. His Majesty King Edward VII presented the Colours to the 6th Battalion The Queen's Royal Regiment (TA), and to the 23rd London Regiment (TA) at Windsor Great Park on 19th June 1909. 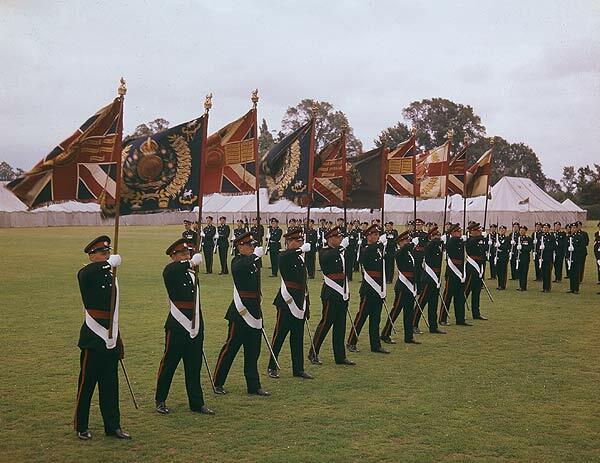 The Colours of the 6th Battalion The East Surrey Regiment (TA) were presented by the Lord Lieutenant of the County of Surrey, Colonel The Lord Ashcombe, CB TD at the Barracks, Kingston-upon-Thames on the 9th June, 1928.